QNAP Systems, a leader in Network attached storage and all things backups, has today announced that QVR Pro, the next-generation surveillance solution featuring the QVR Center central management software and QVR Guard failover protection, is now compatible with an additional 88 models of Dahua Technology’s Eco-savvy 3.0, WiFi 265 and H.265 PTZ series network cameras. 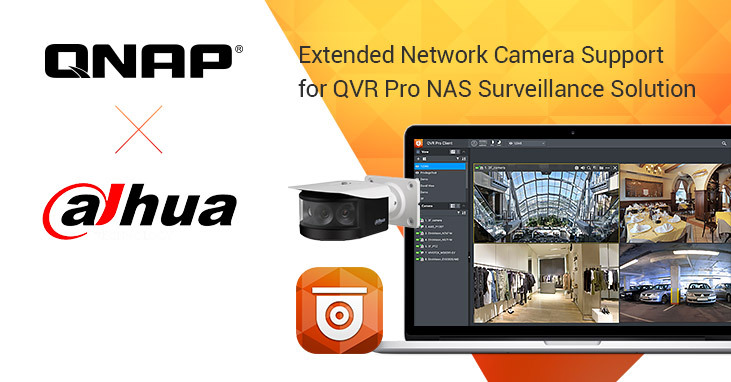 QNAP has worked with Dahua Technology to provide users with greater choice and compatibility in deploying a comprehensive surveillance solution. Dahua’s Eco-savvy 3.0 network camera series can deliver real-time 4K video streams at 15 fps, providing security applications with impressive range of smart detection features. Dahua’s WiFi 265 series supports H.265 compression. Dahua’s H.265 PTZ camera provides a large monitoring range with clear details, while the latest H.265 compression cuts bandwidth in half to ensure video recording with greater efficiency and lower cost.